They say that life is full of small challenges. They’re clearly wrong; all you have to do is start a clothing company and you quickly find that life is, in fact, jammed full of really rather large challenges. In the past week we’ve encountered and overcame a variety of these, ranging from ‘how to turn a bar into a photography studio’, to ‘how to build a temporary shop in a climbing wall’. 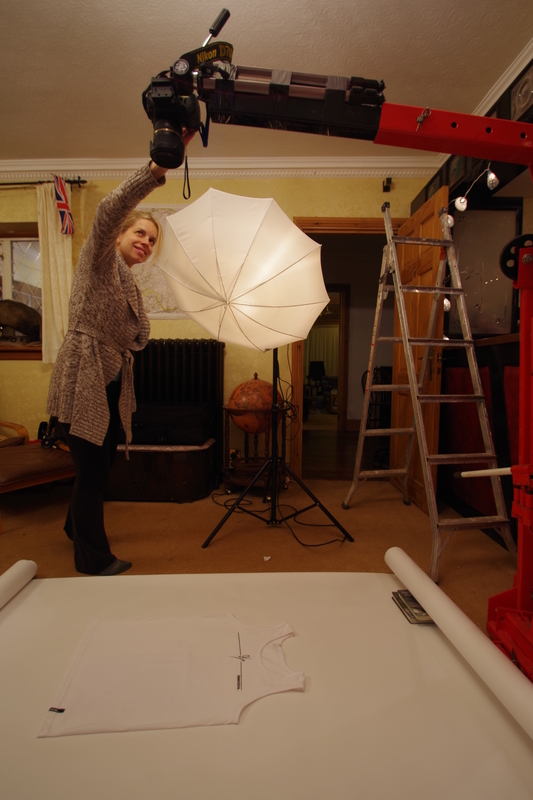 The challenge of product photography was the first of these obstacles we faced up to. Check out any decent clothing website out there and you’ll see nice, professionally-taken shots of their products, presented against a uniform white backdrop. Something we’re all so used to seeing we don’t even bat an eyelid at it – until we decided we needed similar shots. That’s when the headscratching started, and following a bit of research we came to the conclusion that we had 2 choices. We could either pay someone a fairly hefty wedge of money to take the shots, or do what we usually do – learn to do it ourselves, with the help of our friends. Predictably we went for the second option, which meant we had a few things we needed to sort out. 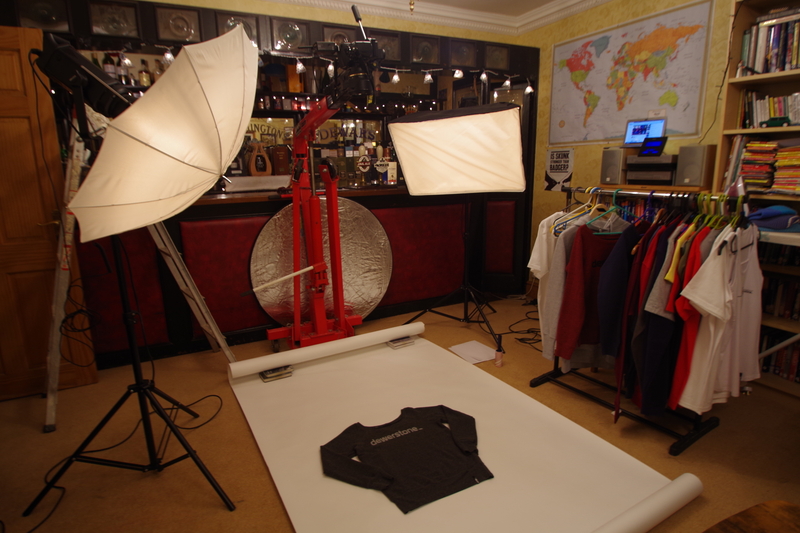 To take the photos, we’d need a large flat area where we could lay out the garments against a white screen, a means to suspend a camera directly above, shooting downwards, and some decent lighting. We decided to shoot the shots in our spacious in-house bar, and in a moment of very ‘V8Nam’ inspiration, pressed an engine hoist into service as our camera arm. That just left the lighting and general know-how, which is where our friend Magdalena Mrvova of Studiomag (www.studiomag.co.uk) came to the rescue, on the understandable condition that she was paid handsomely in curry and wine for her assistance. We kept our side of the deal and in return Magdalena kept hers, lending us a full set of studio lights for the shoot and, even more vitally, bringing along knowledge of how to actually use them. There’s a few shots from the photoshoot below; to see how the product shots turned out, check out the product sections over at www.dewerstone.com. 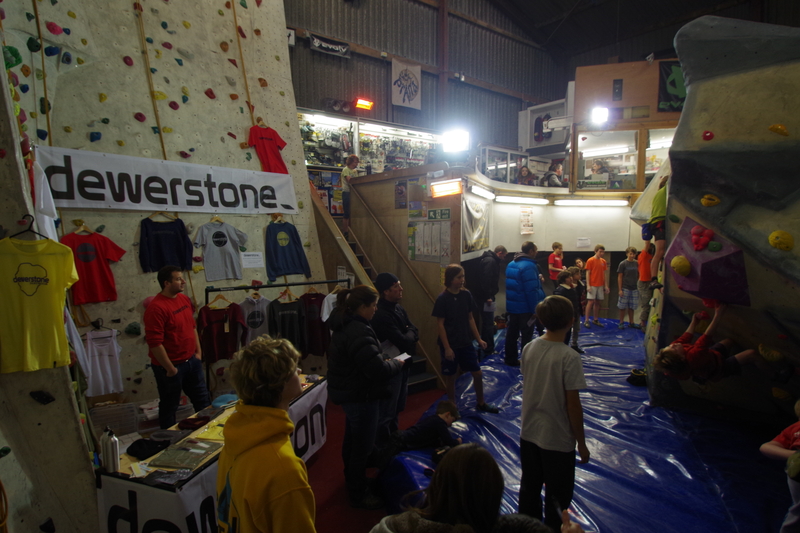 The other big thing in the world of Dewerstone which happened last week was our first sponsored event – the winter bouldering competition at the Barn Climbing Wall, just up the road near Tavistock, Devon. This popular event attracts over a hundred climbers each year, all intent on testing themselves against a range of boulder problems which range in difficulty from the simple to the dizzying heights of about Font 7c. The event was well organised by the guys from the Barn and went off without a hitch, everyone having a great day testing themselves against the 30-odd problems while soaking up the psyche-inducing atmosphere. 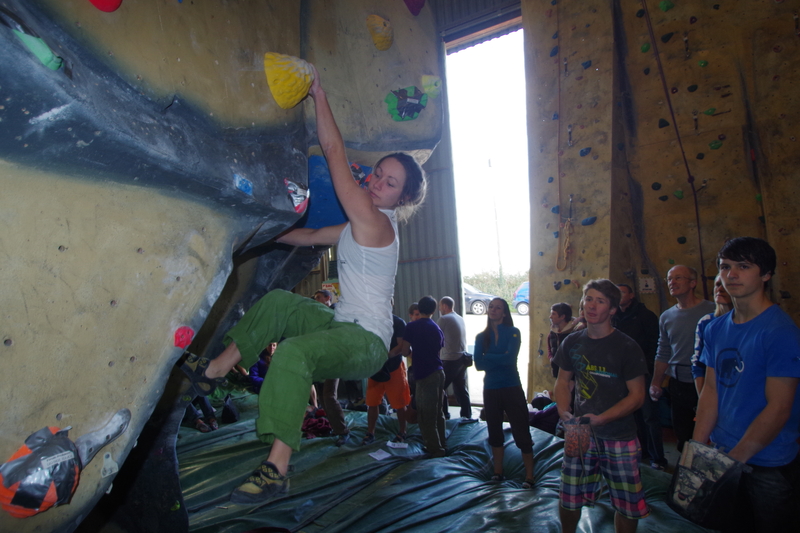 Here’s a few pics from the event to help keep the climbing motivation running through the winter, all the way to the next comp in the spring.